UMass is interested in Matt Stokes a 6-3 245 pd DL from St. Thomas Aquinas HS in Florida. He has offers from Arkansas and Liberty. Interested are Virginia, Virginia Tech and Wake Forest. 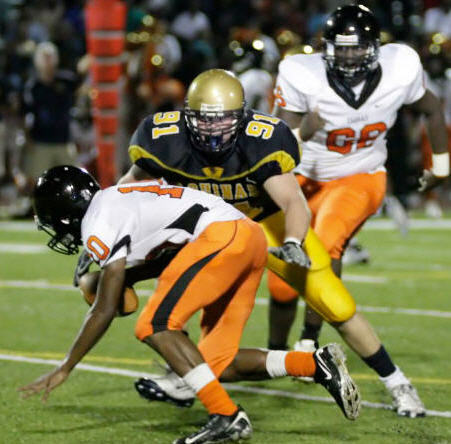 Image from the St. Thomas Aquinas web site. Former UMass DE Keron Williams has a video interview about his role in the Gray Cup. College Sporting News has a web gallery from the William & Mary-Weber State playoff game. UNH football is on solid footing. Keepers College Football Ratings has Villanova, Richmond and William & Mary as favorites in the next round of the FCS playoffs. Jeff Monken was named HC at Georgia Southern. FCS lost another HC when Stacy Adams stepped down as HC at Valparaiso. Northeastern players try to find a way to move on. Recaps and box scores on the CAA squads who went 4-0 yesterday. Three links from the New Hampshire Football Report on UNH's big win over McNeese State here. Brett Kahn of The Sports Network has a long article on the Villanova-Holy Cross game. All the FCS playoff scores here. Game capsules for all the FCS playoff games here. At one time the Montana Grizzlies were down 41-14 to South Dakota State. This article covers their astonishing comeback. The Citizen-Times looks at Appalachian State's struggle to win over South Carolina State. Tom Gilmore says the Villanova Wildcats are better than the 2007 and 2008 Minutemen. The fan who hit a promotional field goal during the UMass-Red Raiders game in 2007 is now the first team kicker for Texas Tech. Former UMass assistant coach Bob Shoop is thriving at William & Mary. Terrance Thomas Sr. reviews the CAA's playoff games in his "CAA Today" essay here. Chuck Burton looks at the FCS playoff games here. David Coulson critiques the FCS playoffs committee's choices. The CAA "Game Day" page for all the CAA teams in action today here. South Dakota State's jack have played the tougher schedule and that leads them to a first round upset of Montana. Eastern Washington in a close game over Stephen F.Austin. Richmond's tough defense is the difference in a win over Elon. Appalachian State should ring up big numbers against South Carolina State. Wish I could see the Villanova-Holy Cross game. It should be a good one. The Crusaders have an excellent offense, but the Wildcats have strength on both sides of the ball. UNH is on the road to McNeese. The Wildcats have been in some shootouts recently. Their defense will have to play better to beat the Cowboys at home. UNH loses it's first round game. William & Mary is usually know for a good offense, but the the Tribe's defense has been stellar this year (see the Bob Shoop post above). The Tribe's "D" will give them a win at home. BTW, the NCAA didn't bother to do a FCS Championship graphic this year. 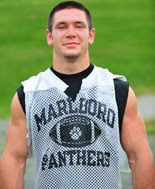 UMass had been interested in Seth Sheridan a 6-1 185 pd RB from Oakmont, MA. He tore an ACL and will likely spend a year in prep school. More on Sheridan here. He was drawing interest from Boston College and UNH as well as UMass. Hope he has a speedy recovery. BTW, a big congratulations to Holy Cross for making the FCS/I-AA playoffs. The Crusaders have painfully climbed back to respectability after the infamous Fr. Brooks blew up the Holy Cross athletic program (a case study on why one-man rule is bad). The NFL is taking a serious look at Crusader QB Dominic Randolph. Updated information about the 2009 FCS playoff brackets. The Sports Network's Brett Kahn previews the 2009 playoffs. A couple of stories about UNH-McNeese state here and here. Villanova has a fan blog I haven't seen before. It bills itself as the "most tasteless and disrespectful" Villanova blog on the net. Next year's FBS opponent Michigan is still having problems. I would like to wish all the Blog community a big "Happy Thanksgiving". Hope all is well with you and yours. 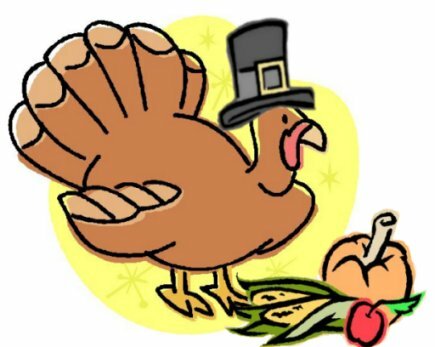 I'm thankful for having the opportunity to run the Blog and meet all the UMass fans. I'm thankful for Mrs Blog. She flew, drove and walked with me a lot of miles this season. Without complaint, she sat through a frog-drowning downpour at Richmond. She's the greatest. 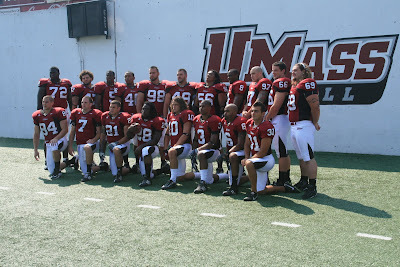 Matty V has two stories about the UMass All-Decade Team from the 2000's. Here is the story and here is the fan vote. Lots of great UMass players. I am grateful I got to see them play. Random thought. Has Detroit ever won a Thanksgiving Day game? Another story about the sad end of Northeastern Football. West Roxbury captains Tony Bland and Garrett Fitzgerald are interested in UMass. Bland is a Scout.com one-star recruit. Fitzgerald is also being recruited by UConn. Apponequet's Joe Bianchini is also interested in UMass. Barnstable's 6-5 285 pd OL Dalton Gifford has been offered a scholarship by UMass. Highlight film for Gifford here. Maryland's Ralph Friedgen is on the hot seat in Maryland. That could mean trouble for Don Brown. The CAA's weekly news and notes for all the league teams here. Keepers College football ratings has Villanova and William & Mary as favorites and UNH and Richmond as close underdogs in the FCS playoff first round. Matty V. has some thoughts about Northeastern dropping football (worth reading). Matty has quotes from both Don Brown and Kevin Morris on the demise of Northeastern football. This article relates the feelings of Northeastern OL Brian Palangi. Matty also has an interview with Coach Morris about the gains and pains of the 2009 season. Ron Chemlis has an interview with UMass AD John McCutcheon about the end of Northeastern Football. The CAA has announced their All-Conference teams yesterday. Vladimir Ducasse, Chris Zardas, Jeromy Miles and and Victor Cruz were first team All-CAA. Tyler Holmes, Kyle C. Harrington and Tony Nelson were second team. Brandon Collier and Armando Cuko were named third team. Two guys were better than Cuko? Armando was third in the nation in kicking stats. Examiner.com has a story on the nine UMass players honored. Josh Buchanan projects the "small school' players who will be invited to the NFL Combine and Vladimir Ducasse is one of them. UMass ended up #24 in the final regular season GridIron Power Index. Chuck Burton has his "CSN Way" column here. Jeromy Miles is on the 2009 Buchanan Award ballot. No UMass players on the Payton Award Ballot. Sam Houston State, Bethune-Cookman and Youngstown State all fired their head coaches. Northeastern cancels its Football Program. Wow! I am very sorry for Northeastern fans. More from ESPN and from the Boston Globe here and here. The Boston Herald here. R.I.P. Huskies football. A loss for New England football. UNH faces McNeese State in the first round of the playoffs. All of Saturday's FCS scores here. Chuck Burton looks at the 2009 playoff field. 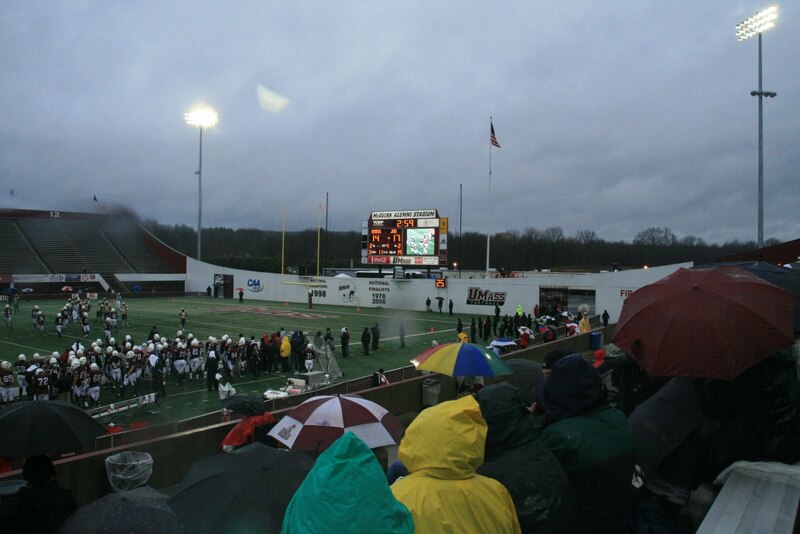 More information about the 2009 FCS Championship tournament here. Mrs Blog and I listened to the game while traveling in eastern New England. WCRN 830 AM in Worcester puts out a monster signal. It was a tough game to listen to, as a mediocre Hofstra team set a all-time passing record against the the Minutemen. It was a disappointing end to a disappointing season. This one is going to take a while to get over. Newday says Hofstra rolled it up. Ron Chimelis on Scott Woodward's first career start. He also has a game article here. The CAA received two seeds and four total teams in the 2009 playoffs. Printable pdf bracket schedule here. The Sports Network has a playoff article here. Dave Coulson has a long article reviewing the last regular season games this Saturday. Both Princeton and former FCS power Georgia Southern fired their head coaches. Hofstra finally has its game notes for UMass here. CAA Game Day page here. Ron Chimelis says UMass needs this game. Matty V. says the last game is important to the UMass Seniors. Chuck Burton has his weekly "CSN Way" column here. Terrance Thomas has his weekly "CAA Today" essay here. I totally missed Amherst College having an undefeated season. Because of a commitment, I will not be able to up-date the blog tonight or tomorrow morning. So--- until then-----GO UMASS! The UMass Daily Collegian has a UMass-Hofstra game preview here. Current CAA standings here. If UMass beats Hofstra and UNH beats Maine, UMass would finish alone in second place in the CAA North. The Sprots Network's Brett Kanh previews the this week's Top-25 FCS games. Another FCS coach resigned last night as Tennessee State's James Weber stepped down last night after upsetting #13 Eastern Illinois. UMass' 2009 FBS/I-A opponent Kansas State needs a win at #25 Nebraska to be bowl eligible. The end of this article discusses the CAA after Old Dominion joins the league in 2011 and Georgia State enters in 2012. 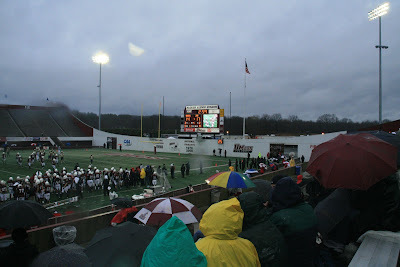 I've posted a Picassa Web Album of the UMass-James Madison game here. Not a great day for photography or the Minutemen. Can you count the number of holds in the image #14? 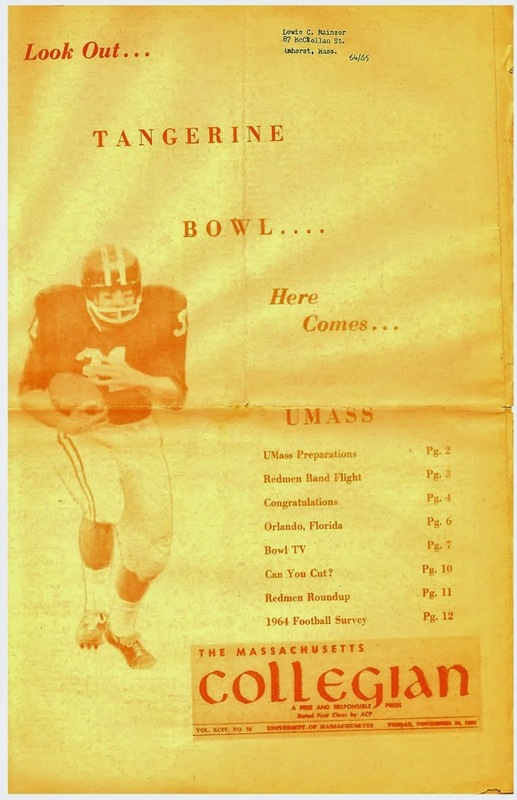 The University of Richmond student newspaper takes a look back at UR Stadium (mentions UMass). The CAA has its weekly conference notes and news here. I read a source that the FCS playoff selection show will be on ESPN News at 3:00 PM Sunday, but it does not appear on the ESPN online schedule. You remember that many CAA teams, including UMass have participated in the the bone marrow registration drive began by Villanova HC Andy Talley? Villanova WR Matt Szczur is a match for a one year old girl with leukema. UMass has its game notes for Hofstra up here (html) and here (pdf). No game notes from Hofstra as yet. UMass still makes the the GridIron Power Index's Top-25 list at #25 and seventh in the CAA. The CAA has its weekly press release with league notes and news as well as this week's game capsules here. Former NFL coach Jerry Glanville has resigned as HC of the Portland State Vikings after going 9-24 over three years. The Sports Network's David Coulson discusses the lastest FCS news here. The Richmond Times-Dispatch states Richmond's Mike London could probably triple his financial package if he became a head coach at a FBS school. The four UMass Football players who were arrested in October have had their cases continued. Their charges will be dropped on March 15, 2010 if there are no further problems. Matty V. looks at the status of the CAA one week before the playoffs. How the FCS Championship series works by CSN. Chuck Burton of CSN looks at who's in. Next year's FBS/I-A opponent Michigan failed to file players practice logs as required by the NCAA-----for the whole year. The Sports Network looks at the latest FCS poll and finds the Salukis are still #1. Keepers College football ratings has UMass by less than a field goal over Hofstra. Remember when you were in High School and you kinda thought the teachers would have to be crazy, because after all, they were serving a life sentence in the educational system? A Massachusetts principal banned students from using the word "Meep!" (from the Muppets character "Beaker"). UPDATE: a lawyer, in solidarity with the students, sent the principal a one-word e-mail saying "Meep". The school system called the police on her. I'll try to be back later today with a Web Album from the JMU game. And you meeping meepers better behave yourselves in the meeping comments section. The JMU student newspaper tell about the first win at UMass since 1987. Matty V. has his three stars from the James Madison game: Tyler Holmes, Perry McIntyre and Josh Maurer. Walpole's Ryan Izzo broke the state scoring record Saturday. He'll be playing lacrosse for UMass next year. Wonder if he'd be interested in joining Travis Tripucka in playing two sports? Next year's BCS/I-A opponent Michigan is having a real long season. Armanti Edwards and the ASU Mountaineers are back. The Boston Globe said UMass dropped the ball. The Boston Herald said UMass was charitable. The Springfield Republican said too many turnovers. Matty V. said UMass could not overcome turnovers. The Richmond Times-Dispatch said JMU made use of turnovers. The Augusta Free Press said JMU won their third straight. The Baltimore Sun said James Madison's defense and TB Noble won the game. The CAA has recaps of all the CAA games here. It also includes a discussion of CAA Championship scenarios and who get the league auto bid. UNH lost to William & Mary, which puts the Wildcats out of the league championship and very possibly on a road playoff game. All the FCS scores and a list of teams who cliched league championships (including Holy Cross) here. Kansas State fell to Missouri on Senior Day and must beat Nebraska next week to be bowl eligible. It started raining torrents as I slogged back to my truck. A soggy end of a disappointing day. I had a feeling this was going to be a close game. Both teams had very good defenses. Both teams have had inconsistent offenses. Once again, the UMass defense played well enough to win. They only gave up 10 points. JMU had a fair amount of yards, but they had to punt seven times. The Dukes had the ball on the UMass six yard line and the defense held them to a field goal. No JMU points in the second half. The UMass offense again struggled. However, the JMU defense is very good. I watched the Dukes defense on a TV game destroy a Delaware offense that ran all over us. This game was going to be tough going offensively no matter what the situation. We needed to play error free football, and then turned over the ball on the first three offensive series. That was the game right there. Mrs Blog didn't like the punt on the four and four, and neither did the crowd, but I can see the coaches point. If we went for it and failed---and four and four is a long shot ---the game was over. We had three time outs and the Dukes punter was only averaging 26 yards a punt. The UMass defense was holding , but then JMU hit their only long pass of the game . I was reminded of another loss in the rain at Rhode Island, when the Rams completed what felt like their only pass of the game, to win. We need to play for pride at the Pride next week and end with a winning record. UMass write-up with notes, quotes and more here. An abbreviated story from JMU here. Well, it looks like a rainy send off for the seniors. The UMass defense played very well in torrents down in Richmond. If the offense can hold on to the ball, it could be trouble for the Dukes. Ron Chimelis says it's the final home game for the UMass Seniors. Matty V. previews the UMass-JMU game and says there is plenty at stake for the Minutemen. Bruce Dowd is back with a issue of his FCS column "Dowd's Den". The CAA has their "Game Day" with information about all of today's CAA games including JMU@ UMass. The game will be on Comcast Sports New England. That's channel 435 on Dish Network. I'll be getting my rain gear together for the game shortly. Come on out to the game. You won't melt! The UMass Daily Collegian has a story about the UMass Seniors. PressConnects.com has a story about UMass FR TB Jamar Smith. James Madison gets some reinforcements for the game against UMass. Terrance Thomas, Sr. has his weekly "CAA Today" column here. The CAA has notes and news about the five CAA squads in the FCS Top-25. The Sports Network's Brett Kahn previews the the Top-25 games in FCS this week. David Coulson reviews the status of FCS and wonders if 20 teams in the playoffs are an option this year. New Hampshire plays William & Mary for a possible top four seed in the playoffs and a first round home game. That's a lot of starters or players who would have started except for injuries. This class went 34-14 over the last four years. They need wins tomorrow and at Hofstra to tie the 2006 and 2007 classes for most career wins. Nice article about Armando Cuko from Masslive.com. Matty V. has a blog post on three stars from the Northeastern game. Hard to argue with Tony Nelson, Mike Mele and Armando Cuko. The Eagle-Tribune has a story about Zack Tulley a 6-1 190 LB for Pinkerton Academy. He's the son of three-time All Yankee Conference UMass LB Matt Tulley. Matt led the UMass defense in tackles in 1991 with 44 UT 29 AT 80TT. He also led the Minutemen in sacks in 1988 and 1999 with 6 and 9 respectively. Matt is 12th in UMass career tackles (325) and 5th in career sacks (26). Attention John McCutcheon---Boise State is selling stock in the Athletic Dept for $100 a share. UMass has its JMU game notes in html here and pdf here. The win over Northeastern moved UMass back into the FCS top-25 in the Gridiron Power Index. The CAA's weekly press release with notes about the league and each individual team here. David Coulson of The Sprots Network has his weekly "Around FCS" column entitled "Ripples of a Victory". Kansas State controls their own fate in a bid for a bowl game. Fired HC Tommy West said James Madison and William & Mary have better football facilities than Memphis. Idaho State coached by former UMass coaches John Zamberlin and Joe Cullen almost upset unbeaten Montana Saturday. Jasper Howard, the UConn football player stabbed to death in a campus fight, threw the first punch according to this report. Ron Chimelis says UMass is fighting to keep a flicker of hope for the playoffs alive. Transcript of Coach Morris' weekly CAA teleconference remarks. Audio link to Mickey Matthews teleconference remarks. Matty V. says the FCS playoff picture is emerging. James Madison's UMass game notes here (html) and here (pdf). Armando Cuko was named UMass' Athlete-of-the-week. James Madison's QB Justin Thorpe was named the CAA Rookie-of-the-Week. Current FCS polls here. With Richmond's loss Saturday, the Southern Illinois Salukis jumped to #1. Keepers College Football Ratings has UMass over James Madison by less than a touchdown. He also has William & Mary by almost two TD's over New Hampshire. 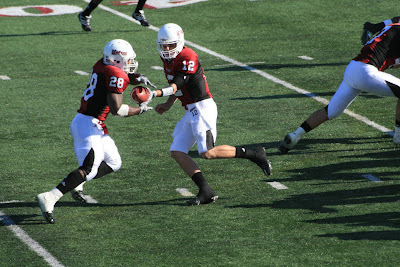 I've posted a 40+ image web album of the Northeastern game on Picassa. The brilliant sunshine made for fast shutter speeds and thus better action shots. Matty V. says Tony Nelson is back in stride. The Boston Herald has Armand Cuko as a "Herald Hero" for tying the UMass all-time career field record. UMass Daily Collegian has more on Nelson and Cuko here. CAA league standings after Saturday's games. The James Madison student newspaper says the Dukes have their swagger back. Old Dominion, slated to join the CAA in a couple of years, became the winningest startup program ever Saturday. Kansas City.com says that Bill Snyder is making things look easy for Kansas State. Whoa! Dartmouth has a two game win streak going. The new scoreboard is nice. It is crisp and new. The video board is small, but has good definition. 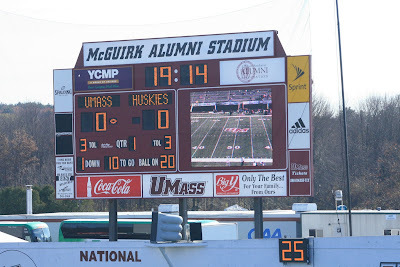 We were able to watch replays and it's definitely an enhancement to the McGuirk experience. Click on the image and Blogger displays a much large view. The Boston Globe says it was a not moving day for the Huskies. The Boston Herald says it was the Minutemen in a rout. Matty Vautour said the offense clicked. All the CAA scores and recaps here. Villanova stopped Richmond's 16 game win streak. Mrs Blog an I watched the end of the game on Comcast Sports after we returned home. More on the *&%#! end of the Richmond-Villanova game. All the FCS scores from 11/7/09 here. Our 2009 I-A opponent Kansas State defeated arch-rival Kansas to run their record to 6-4 and 4-2 in the Big 12. One more win and the Cats will surely go to a bowl game. Albany had their school record 12 game home winning streak snapped on a last second field goal. Well, after the game, Mrs Blog and I stopped at our exclusive wine store----- Big Y, and bought a bottle of vino. Mrs. Blog offered a toast during supper to the win. The UMass defense held the Huskies to 145 total yards. The first team offense played mistake free ball. Tony Nelson showed what he means to the offense. All this with UMass missing even more players. Both Tyler Holmes and Jonathan Hernandez did DNP and did not dress for the game. Two new UMass players received significant playing time and did well. Syracuse transfer Mike Mele started at MLB and led the team with 10 total tackles. He also hooked up with the Northeastern TE on two long passing plays and stayed with the receiver 40 yards down the field. Cedric Gonnet was the second string TB and had 13 carries for 45 yards and a 4.5 yards/carry. Armando Cuko was 3 for 3 and set the UMass single season field goal record. One victory down and two to go. Let's enjoy the win. Ron Chimelis says UMass Football's playoff hopes are slim. Matty V. says all the Minutemen's remaining games are must wins. The CAA has it's Game Day page here. The Rhode Island-UNH and the Villanova-Richmond games are on Comcast Sports New England, so set your DVR. Speaking of Richmond they just received two years of probation for NCAA violations mostly relating to Basketball. More here. Kansas State needs two more wins to be bowl eligible. The person who tried to post a message to potential UMass recruit Kristjan Sokoli (see Wednesday's post) in the comments should try to contact him through social medial like Face Book. A couple of reasons: the message is not private for one thing and since I'm a season ticket holder and a member of Friends of Football, that makes me an agent of UMass in the eyes of the NCAA. We don't want to cause any problems for either UMass football or for Sokoli. See Richmond's troubles earlier in this blog post. Just for the record, although the UMass Sports Information Office has been very nice to me, I get zero perks or encouragement from UMass Football. Let's beat the Huskies and get started on three straight wins to close out the 2009 season! UMass is recruiting Anthony Carter a 5-9 172 pd Safety from Marlborough, MA. Has his own football page and bio information here. Carter holds offers from Holy Cross and San Diego. Has recruiting interest from I-A schools Arkansas. Perdue. Stanford and Vanderbilt. FCS schools interested are Brown, Holy Cross, Rhode Island and Southern Illinois. Image from Carter's web page. Northeastern's David Akiniyi has been named Academic All-District by ESPN. CSN's Terrance Thomas looks at this week's league news in his "CAA Today" column. Bruce Dowd returns after a hiatus from his "Dowd's Den" column. The Sports Network's Brett Kahn previews this week's Top-25 games in the FCS. A former NFL GM says Appalachian State's Armanti Edwards can play in the NFL. Again, I found the link over at the always interesting Draft Daddy. The UMass Daily Collegian has a couple of stories here and here. The Collegian looks at the road woes of the UMass Football team and a preview of the Northeastern game. The CAA has some notes and stats on the league's standing in this week's Top-25 rankings as well as the lambert Cup. The Big Game in the CAA is this week's clash between #1 Richmond and #4 Villanova. If you happened to watch last week's game between James Madison and Delaware, you were impressed by JMU's Arthur Moats. We'll get to see him in person in just more than a week. Next year's BCS/I-A opponent Michigan, is seriously demoralized. Rivals.com has a feature about how Texas Tech HC Mike Leach uses film study to teach his quarterbacks. UMass is interested in Kristjan Sokoli a 6-5 230 pd DL from Bloomfield, NJ. This article features Sokoli. This article mentions him. Sokoli has interest from I-A schools Boston College, Cincinnati, Pitt and Rutgers. FCS schools recruiting him include James Madison, Lafayette and Rhode Island. UMass has its game notes for Northeastern here (html) and here (pdf). Josh Buchanan has an article on "Small School Risers and Fallers". He also has a NFL Draft Top-40 FCS players. Two UMass players make the list. CSN has a column about the rise of Stony Brook in the Big South. The CAA has its weekly league press release up with all the latest league news. Maine's Donte Dennis was named CAA Defensive Player-of-the-week for his performance against UMass. Matty Vautour looks at the UMass QB situation. Ron Chimelis looks at the UMass QB situation. Matty V. is also looking for your input on a UMass Football All-Decade Team. The Northeastern Huskies look at UMass (html). And pdf. UMass has dropped off the GridIron Power Index. Keepers College Football Ratings has UMass by 22+ over Northeastern. More on Richmond's Associated Press Top-25 (in Division I) vote. David Coulson looks at the state of FCS after last Saturday's games. Syracuse's best WR Mike Williams has quit the team. I first spotted this link over on Draft Daddy. The two-game losing streak has certainly brought out the rants in the comments. I've been editing quite a few. The UMass football Blog is a positive place for UMass football. My policy is that if a fan just wants to rant, then message boards are the place for that activity. If there are complaints/suggestions about how the program is run, then contact with the AD or coaching staff is the way to go. In addition, there are some trolls who hang around, bad mouth the program, and then say "We' in an attempt to make people believe that they have a UMass connection. As for me, I say let's beat Northeastern and get this train back on track. Maine finally has its UMass game article up. Matty Vautour says for the second straight year Maine likely derailed UMass' playoff hopes. More on the game that ended Albany's eighteen conference win streak. For the first time in two years a FCS team has received votes in the AP Top-25 list. It's Richmond. One thing that would help UMass turn this season around would be to get the running game back on track. We had 62 rushing yards against Richmond and 82 against the Black Bears. If you can run the ball, pretty generally you then have a good lookin' quarterback. Northeastern is last in the CAA in rushing defense, giving up 205.1 yards per game. This would be an excellent time to work on the running game. The Boston Globe says the Black Bears picked off UMass. The Kennebec Journal said Maine stopped UMass. The Maine Campus said Maine's defense powered by UMass. The Springfield Republican says six turnovers did in UMass. Matty Vautour says turnovers throttled (a good choice of words) UMass. Thirteen turnovers in two games will certainly wreck your effort. UMass is now tied for third in the CAA North and a very long shot for a playoff birth. The Maine loss will probably knock UMass out of the FCS Top-25 polls. All of the CAA game recaps here. Besides UMass, the big upset in the the CAA was James Madison crushing Delaware. Brandon Banks had a school record 351 yards, but K-State fell to Oklahoma 42-30. The Albany Great Danes lost their first NEC Conference game in three years.